The Ancient World is full of inscriptions with the Common, Global, Greek Pictographic & Ancient Linear System of Writing-Reading of ancient speech! 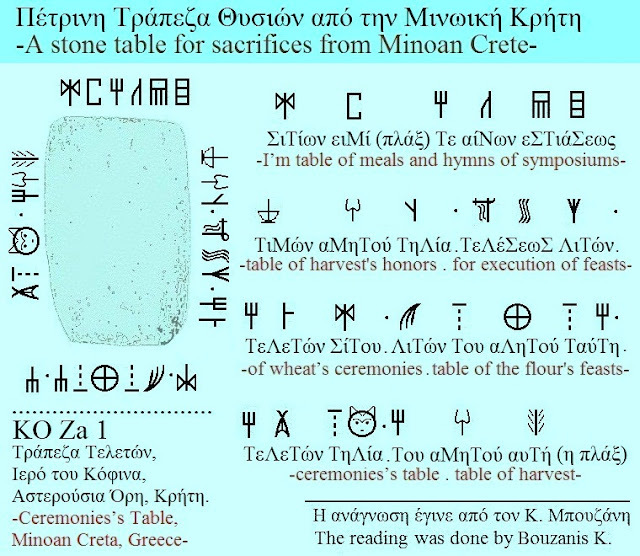 And here, on this stone table for sacrifices and hymns from Asterousia Mountains of Minoan Crete, beats the heart of Hellenism! 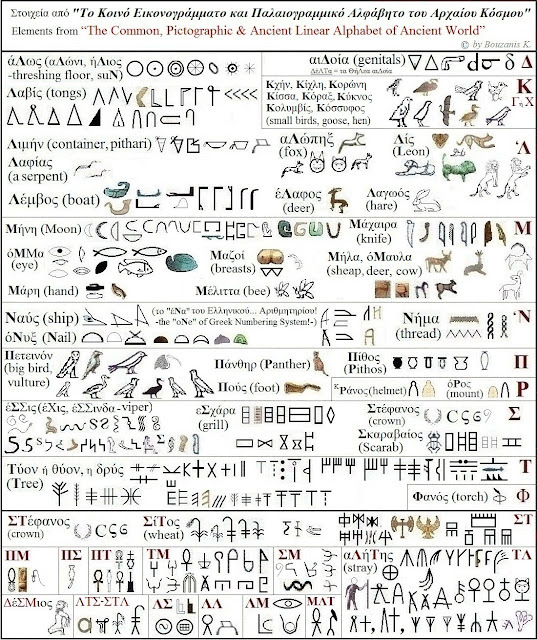 Diachronically, the engraved, carved or written decoration on utensils, tools, containers, jewelry, coins, votives, buildings, tombs, etc., anywhere, not constitute, exclusively, inspired artistic representations or symbols, such as at first sight seems on unsuspecting or illiterates... every era, but, very often, texts-inscriptions. Really, going uphill from the Hospital of ‘Levin (Asklepieion), sad due of his imminent death, in the Sanctuary of Asterousia (Kofinas), what else would be needed to take care, someone insubordinate Cretan, legacy in the centuries of centuries, for revelers and brave Cretans? In the beginning was the word! The reasonable person have voice, therefore, does not write, like illustrator, nor... encrypts! The reasonable person have voice, and in Prehistoric Globalized World, because of trade, must had a Common linguistic Code and could not change it neither every one thousand nor every more of thousands years! Αναρτήθηκε από Μπουζάνης Κων. - Bouzanis K. στις 7:16:00 μ.μ.